Which tactics are the most effective against attackers who use topspin drives or loops? If you're playing against an attacking / offensive style table tennis player who uses topspin drives and loops, which tactics should you use against them? Which tactics are the most effective against attackers? Well, before you can implement any tactics against attackers you first need to have developed your own table tennis skills to a reasonable level. So it's important that you've mastered at least the four basic strokes before you start thinking about which tactics you should use in a table tennis match. You should also note that tactics are only useful if you're playing against a player of a similiar standard to yourself, or a player who is slightly better than you. If you're playing against a player who is at a much more advanced level than you, then it's unlikely that any tactics you employ will be effective because the difference in playing standard will negate any tactics which you try to use. So by improving your standard of play you'll also be able to use a wider range of tactics in order to defeat your opponent. Therefore it's important that you practice your own table tennis strokes first. 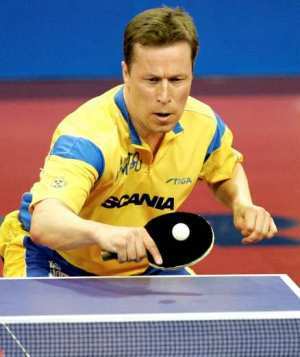 There really is no substitute for practice if you want to improve your table tennis skills. After you've developed your own skills, you can then start to consider which tactics you can use against different opponents. Different tactics will be required depending on the general style of play that your opponent uses. Although we are looking at players who use a predominantly attacking / offensive style of play, there are many different variations within that general style of play. Some players will use strong topspin loops whilst others will use topspin drives or even a mixture of both. They may also use both forehand and backhand strokes or they may favour one particular stroke over the other. This means that you may have to counteract lower trajectory drive strokes or higher trajectory loop strokes. But any table tennis player who uses an attacking / offensive style of play will always be looking for every opportunity to attack first by playing a strong topspin stroke. And the easiest way for them to deploy a strong topspin stroke is if their opponent plays a long, deep shot which causes the ball to travel beyond their end line after one bounce. When the ball is played long it gives the attacker the opportunity to play a longer stroke with a fast upward brushing motion which means they can generate more topspin on their shots. So in order to counteract this style, your main tactic will be to try and limit their opportunities to attack. Placement of the ball is very important for these tactics, as is varying the speed and spin of your returns. The first tactic you can use is to play the ball short and low over the net with a forehand or backhand push. If the ball is played short and low over the net the attacker will not be able to play a long stroke, so they will not be able to generate as much topspin. A second tactic is to make it difficult for your opponent to play their preferred stroke. So if the attacking player plays close to the table, playing fast returns into their crossover point (right hip / right pocket area for a right-hander) can be very effective as they'll have less room to play their stroke and will also have to quickly decide whether to play a forehand or backhand stroke. A third tactic is to play your shots down the middle of the table or from side to side. By playing down the middle of the table it reduces the angles that they can play on their return. And playing side to side is an effective tactic if their footwork and movement is not good, as you can move them from side to side and get them out of position. A fourth tactic is to try and vary your shots using different speeds and spins. Some attacking players prefer to play fast, whilst others prefer to play slower, so if you're able to play a mixture of slow (high trajectory) topspin strokes, fast (low trajectory) topspin strokes and variations of backspin strokes, you'll discover which ones your opponent has the most difficulty with. This will vary from player to player but by playing the optimum stroke you can limit your opponent's opportunities to attack. A fifth tactic is to keep the ball in play for longer than your opponent. This can work really well against certain players because in order to play with an attacking style you require fitness, speed and athleticism. So some table tennis players who are past their physical peak or hampered by injuries, may find it more difficult to sustain long rallies. A sixth tactic against attackers is to try and attack first. If you're able to initiate the first attack you can put your opponent on the defensive and therefore put them under pressure. One of the best ways of achieving this is to develop serves which enable you to launch the first attack. For more information about how to improve your service and how to serve in order to help you attack first, see my book entitled "Service Secrets". Improving your service and return of service will add three points, or more, to every game you play. Why are recovery and anticipation important tactics?